This is simpliest and most common fry in the andhra household. I have blogged two post on potato fry.And out of all the fries this is my favourite.The combo of potato and fresh fenugreek leaves is awesome.This goes well with hot rotis or rice. Pressure cook potatoes.Peal the skin and mash it with hand.Set aside. Take oil in a pan.When oil is hot add rai and curry leaves.When rai splutters add onions,green chillies and garlic. Fry till the onions are light pink in colour. Now make a well in the pan add chopped fenugreek(methi) leaves and cover it with the onions. Then saute onions and methi leaves till the leaves changes it colour.Now add turmeric powder and salt. Add mashed potatoes and mix throughly.Fry for another 2-3 minutes and see that the curry doesn't get burned. Lastly add red chilly powder and mix throughly. 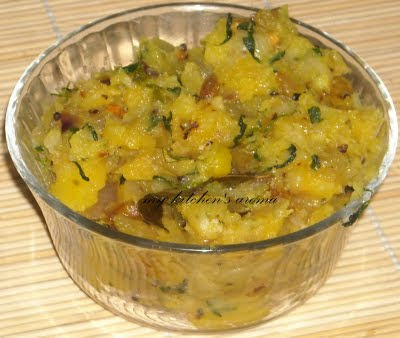 Serve it with hot rotis or rice. PS:-I used the big fenugreek leaves as i don't get the small ones which we get in india.This leaves are less bitter compared to the smalls ones. Aaloo methi looks yummy to me..
Lovely dish, would love to have some with roti now. Love ur dish dear! Love to eat any kind of fenugreek leaves. Preparation is wonderful! 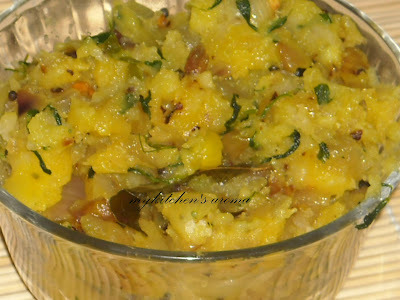 hopped in here from Dipti's blog..
you have a nice blog here and this alu methi looks so yummy..